2018 World Cup Qualifications - South America - Argentina v Peru - La Bombonera stadium, Buenos Aires, Argentina - October 5, 2017. Lionel Messi of Argentina reacts. Argentine coaches working in South America have done their national team a few bad turns over the past two years and Jorge Celico could deny the twice champions and 2014 runners-up a place at the World Cup in Russia next year. Celico, little known in his native Argentina, could help to dash the hopes of Lionel Messi’s team if his Ecuador side deny them the win they need in their final qualifier on Tuesday in the tricky venue of Quito at high altitude in the Andes. “Destiny put things in your path that you don’t imagine,” Celico was quoted as saying by Argentine broadcaster TyC Sports. “I have a big commitment to the people of Ecuador, because I have done my (coaching career) here. Today I have to be thankful for that and do my best, as is right,” he said when asked what it meant to face his country. 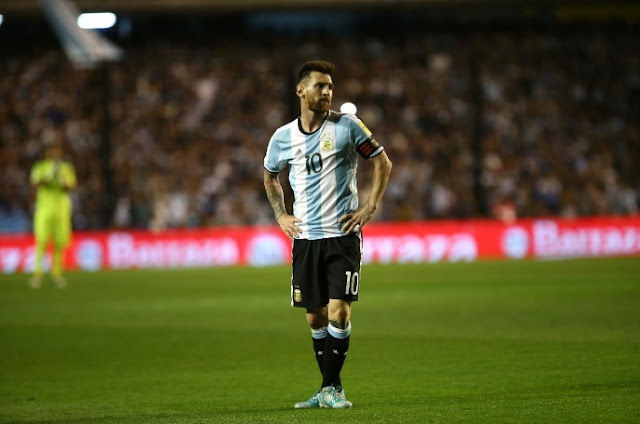 Argentina’s current campaign, in stark contrast to the last World Cup cycle when they qualified comfortably and reached the final in Brazil, has been dogged by Argentine FA mismanagement, two changes of coach and poor results. Gerardo Martino steered them to the Copa America final in 2015 but they lost on penalties to the Chile team managed by Argentine Jorge Sampaoli, who is now at Argentina’s helm. Chile were under Argentine-born former Spain striker Juan Antonio Pizzi when they stunned Argentina again a year later in the final of the Centenary Copa America in the United States, also on penalties after another 0-0 draw. That result promoted Messi to quit international football, fearing he might be responsible for his country’s jinx. Martino also quit but Messi came back under new coach Edgardo Bauza, although the team did not improve and he was replaced by Sampaoli. Meanwhile, Peru were beginning to rediscover the sort of form that saw them reach three World Cups between 1970 and 1982, their last, under Argentine coach Ricardo Gareca. Peru held Argentina to a 0-0 draw in Buenos Aires on Thursday that left Sampaoli’s team in sixth place in the 10-nation South American group, out of the qualifying places for Russia. A bad omen is that Argentina began their qualifying campaign with a shock 2-0 home loss to Ecuador two years ago when they were coached by Argentine Gustavo Quinteros.